"Cosmos – a Place for Young Culture" is a competition proposal for finding a new contemporary function for an old and abandoned, but emblemathic cinema in the city of Plovdiv and the square in front of it. Plovdiv is a centuries- old Bulgarian city, famous for its architectural heritage and its cultural traditions. It has numerous museums, galleries, theaters and antique artifacts. Plovdiv is also a city with many active youth movements and organizations - "Youth‘s Voice", "The Youth for Plovdiv" etc., which seek to establish the place of youth in the active social life, to support youth development and the deployment of young people‘s potential. The project aims to provide these active young people with the appropriate active type of urban cultural environment - a place where they can express themselves through art, to experience art, to be active and to meet other young people. The building of the cinema "Cosmos" has a remarkable architectural value and demolishment should not be an option. In support of the overall concept, we propose an adaptive reuse. A skate ramp is introduced after removing part of the stands and the vertical wall behind the projection screen is transformed into a climbing wall. The cinema function is also preserved by pulling out the projection screen in front of the climbing wall when needed. The whole facility is designed barrier-free. In Bulgaria it is still difficult for the young and emerging artists to find a place and opportunity for self-expression. 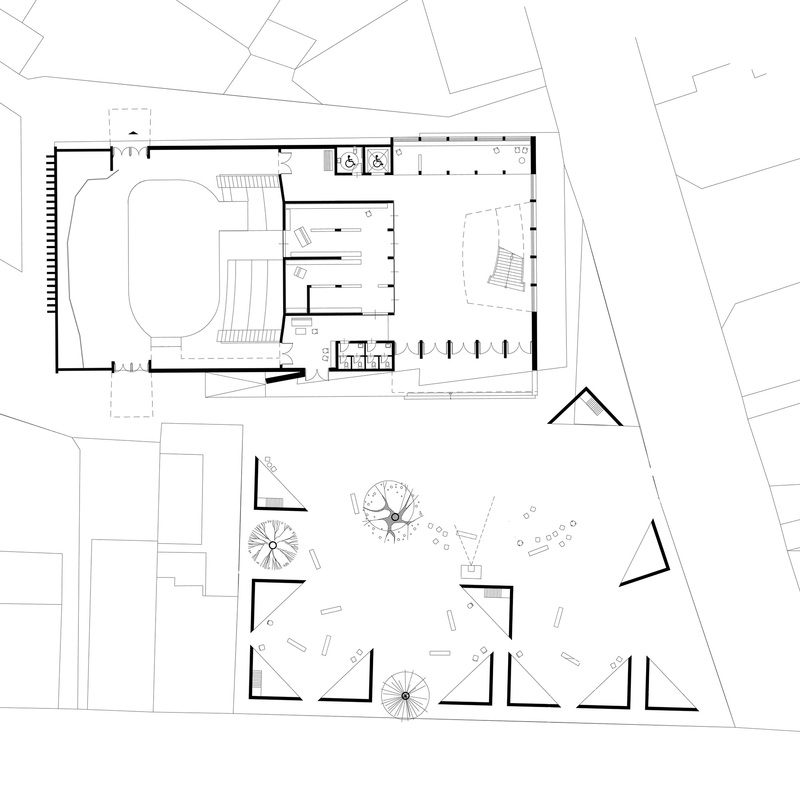 In view of this fact the project proposes freeing the space of the square of the present parasitic temporary buildings and placing several lightweight temporary pavilions to be leased to young artists at a cheap price. Rental should be granted for several months after the presentation and screening of the artist‘s portfolio in the local municipality. The square space thus becomes a "city within a city" - a dynamic stage for young art.